Recent synodal history suggests that more will be afoot at the Amazonian Synod than what its announced theme suggests. The slogan “Nothing about us without us” was used by Solidarity in the 1980s in Poland, borrowing a royal motto from the Polish-Lithuanian Commonwealth in the mid-second millennium. Then, it was expressed in Latin: Nihil de nobis sine nobis. Later, it appeared in Polish on the banners of 19th-century Poles fighting their country’s partition by Russia, Prussia, and Austria: Nic o Nas bez Nas. Today, it’s often used by disability activists asserting their claim to be fully participant in society. “Nothing about us without us” also applies to the Special Assembly of the Synod of Bishops for the Pan-Amazon Region, which will meet in Rome in October. That Synod will involve seven bishops’ conferences from nine Latin American countries who will consider their pastoral situation under the theme, “Amazonia: new paths for the Church and for an integral ecology.” As is usually the case in these meetings, the bishops at the Synod will work with materials drafted in Rome. Early indicators from the Synod’s preparatory document suggest that the Amazonian Synod will be longer on environmentalism than on theology. 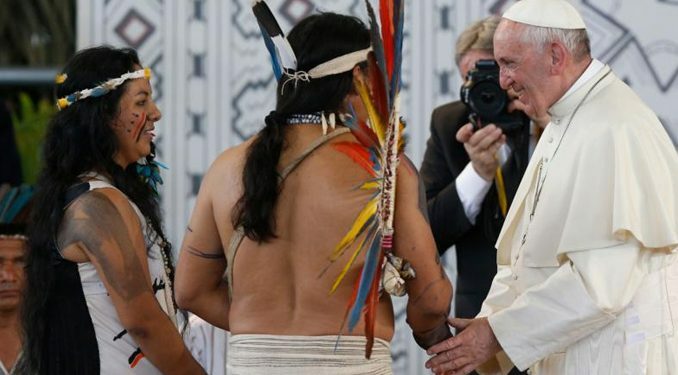 International media attention will doubtless focus on the Synod’s discussion of climate change and its relationship to Amazonian deforestation. Recent synodal history suggests, however, that more will be afoot at the Amazonian Synod than what its announced theme suggests. The 2014 and 2015 Synods were called to consider the crisis of marriage and the family throughout the world. Yet they became the occasion for powerful churchmen to try to deconstruct Catholic moral theology and sacramental discipline, according to the tried-and-failed theologies and pastoral practices of the 1970s. The 2018 Synod, summoned to discuss youth ministry and vocational discernment, began with an effort by the Synod general secretariat to enshrine the world’s language of sexual plasticity (and the lame understandings of happiness that underwrite that language) into an official Church document. When that failed, Synod-2018 became the occasion for the Synod general secretariat to promote an ill-defined notion of “synodality” that struck more than a few bishops present as a prescription for local-option, choose-your-own-doctrine Catholicism on the model of the (imploding) Anglican Communion. This pattern seems likely to continue at the Amazonian Synod. There, the deeper agenda will be the ordination of mature married men — viri probati — to the priesthood. Proponents will argue that this dramatic change in the Church’s longstanding tradition of a celibate priesthood (which, contrary to much misinformation, antedates the early Middle Ages by hundreds of years) is necessary because Amazonia is a Catholic area deprived of the Eucharist by a lack of priests. 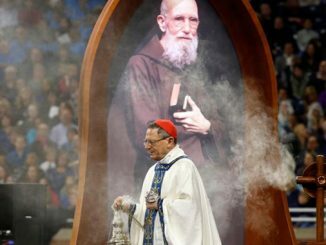 One hopes that the counterclaims — that Amazonia is mission territory requiring wholesale evangelization, and that Amazonia’s lack of priests reflects racial and class divisions in Latin American Catholicism that discourage priests of European pedigree from working with indigenous peoples — get a serious hearing. Proponents of ordaining viri probati in Amazonia, including retired Brazilian Cardinal Claudio Hummes, OFM, have insisted that any such concession there would have no implications for the universal Church. That cannot be, however. 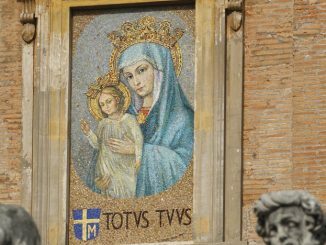 Should the Amazonian Synod request the Pope to grant a dispensation from the discipline of celibacy for that region, and should he grant it, it will be just a matter of time before bishops conferences elsewhere — Germany, Switzerland, Belgium, and Austria come immediately to mind — make similar requests, citing pressing pastoral needs. On what ground would those requests be denied? We can be grateful to the cardinal for his candor in, however unintentionally, letting the celibacy cat out of the synodal bag. Any decision to ordain viri probati in Amazonia would inevitably have major consequences for the entire Church. A decision of this magnitude cannot be taken by an unrepresentative segment of the Church and then turned into a “model” for everyone else. That is why the principle of “Nothing about us without us” must apply here. 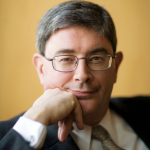 Whatever else “synodality” may mean, it surely must mean that decisions bearing on everyone should involve as broad a consultation and as global a reflection as possible. 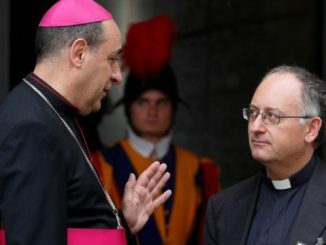 Bishops who agree should make their concerns known now, not after the Amazonian synod meets. I pray for them, and all global culture-of-death mafiosi like Cardinal Mahony and Cardinal Cupich and Cardinal “night-night” Tobin and McElroy of San Diego, who are without doubt enemies of the Church established by Jesus. McCarrick clearly doesn’t listen to the commands of the Lord Jesus. This is another act in the long kabuki ritual ending in a Protestant-type Catholic Church. The tipping point has been reached. Get ready. This legacy of the Iberian colonization of the New World needs to be acknowledged, and much of the rest of Ibero-America needs wholesale evangelization, too. “…and would do so in a way that Amazonia could be “a model for the whole world.” Is this not though a clever ploy? Go to help save a rain forest (a valuable pursuit for the environment of the whole world) and in the midst of a deep forest change the tradition of the Church for the whole world. Pope Francis tried his consensus building for change out in the open and failed; now he brings about his will in the deep woods allowing it to spread from there. I think Sauron once attempted this in Mirkwood. I think everything Pope Francis is doing to destroy the Catholic church will be reversed with the next Pope. God is good all the time. All the time God is good. “Nothing about us without us” – is the right way of going about in these post colonial and post modern times. Looked up “Nothing About Us Without Us”, which doesn’t seem like a sound Catholic concept. In light of the current state of the Church “Everything About Christ, With Christ” would be far better!